The typical hair and hair follicles of African-Americans are tightly curled, thus producing hair that spirals. African-American hair also typically has a larger diameter and retains less water, thus its relatively course. The many styling methods utilized on African-American hair cause concern with hair loss. African American hair is very strong, however because the hair cuticle is so thin is easier for the hair to become damaged with the use use of chemicals and tight hair styles. What makes African-American hair different than other races? African-American hair typically has a tighter curl pattern which makes our hair more fragile than others. African-American hair has a tendency to dry out or weather more and is more prone to breakage due to wears & tears of the cuticle layers. African-American hair follicles produce more sebum than other ethnic groups, however, due to it’s curly nature the oil cannot evenly flow throughout the hair properly. This causes the need for additional oils and other hair care products to make hair more manageable and to prevent unnecessary breakage. Relaxers used to straighten hair can cause a great deal of heat and chemical damage to hair and scalp, which can also cause Central centrifugal cicatricial alopecia (CCCA), and over time can cause permanent hair loss. This becomes especially true when the heat or chemically processed hair is pulled tight by rollers or a hot curling iron which can lead to traction alopecia. Consider that hair relaxers commonly used on African-American hair contain lye or similar chemicals that break down the hair shaft. Left on beyond the recommended time, these chemicals would eat right through the hair and cause it to fall out in clumps. This is why these same products are used in products like Drano® to clean clogged drains which often are clogged by hair. No-lye relaxers are very popular today, mainly because it leads people to believe that the product is not caustic. This is far from the truth. Relaxers, whether with or without lye, have a very high pH (very near the top of the scale) which makes them very caustic. Relaxers break the hair down. Relaxers work because they break the bonds that actually give strength to the hair. This causes the hair to straighten. Therefore, relaxed hair is, by definition, weaker than natural hair. Relaxers also deplete the hair of sebum (the oil your scalp secretes). Combine that with heat from blowdryers and flat irons it is very easy to damage the hair and scalp. Hair that has been straightened will be weaker as opposed to if it were natural and will is more susceptible to hair breakage (Trichorrhexis Nodosa). The combination of calcium hydroxide and guanidine carbonate are combined to form guanidine hydroxide, which could just as easily clean a sink. Repeated use of such products can cause some degree of hair loss, and if scarring occurs while using these chemicals, the hair loss can be permanent in that area of the scalp. One must ask themselves is it wise to place such caustic chemicals in the hair on a regular basis for the sake of desired appearance? The question must be answered by each individual, however the facts should be known. Minoxidil is the only topical ingredient FDA approved to stimulate hair growth and to stop hair loss is Minoxidil. No one knows the exact mechanism for which minoxidil works. However, it is believed that because minoxdil is a vasodilator it allows more oxygen, blood, and nutrients into the blood capillaries of the follicle. Hairbotics Stimular Plus Minoxidil Regrowth Serum which is formulated by Trichologist Bobby Spence has been used clinically by Trichologist, Dermatologists, Doctors, and Hair Stylist to treat their patients and clients with traction alopecia (hair loss at temples and nape of neck), cicatricial alopecia (hair loss from relaxer damage), androgenetic alopecia (heriditary), alopecia areata (auto-immune hair loss), telogen effluvium (excessive shedding), diffuse thinning (overall thinning throughout entire scalp), and other types of hair loss. The above picture is an actual user of minoxidil. She had traction alopecia from wearing weaves and lace front wigs. CCCA (Central Centrifugal Cicatricial Alopecia) Central centrifugal cicatricial alopecia is a common cause of progressive permanent alopecia. This form of hair loss was previously know as hot comb alopecia, follicular degeneration syndrome, or pseudopelade in African Americans. The constant over-processing of the hair using Relaxers and Hair Color causes and inflammatory response to the scalp and literally burns and scars the follicles. When this occurs the hair loss in permanent. Clinical features include a smooth and shiny scalp in the affected areas usually affecting the crown and vertex of the scalp. Traction Alopecia Traction alopecia is a form of hair loss caused by gradual pulling of the hair from tight hairstyles such as ponytails, braids, weaves, dreadlocks, and hair extensions. This type of hair loss is very common among African-American women and is evident by the loss of hair around the temples and the side of the head. It is also caused by excessive use of Relaxers, Brazilian Keratin Treatments, Texturizers, and other hair chemicals. 1. Hair Loss caused by chemical damage. Over processing of the hair due to hair color, relaxers, perms, highlights will cause hair breakage (Trichorrhexis Nodosa) and will cause the hair cuticle to become frayed and leak proteins. Split ends (trichoptilosis) will also occur. 2. Hair Loss caused by Vitamin Deficiency. Low Ferritin (iron storage) and Vitamin D are closely linked to hair shedding and hair breakage. When iron is low the hair loses elasticity becomes dry and brittle and constantly breaks off. Lose anagen syndrome can also occur if the connective tissue of the hair bulb is weak. 3. Hair Loss caused by birth control. Some birth control pills, IUD’s can shock the body and cause hormonal imbalances that can trigger diffuse hair loss (telogen effluvium) which causes hairs to pass prematurely to the telogen stage. During the stage of hair growth we normally lose between 50-100 hairs however, due to the sudden shock you will experience excessive hair shedding which you will see in your brush or bathroom floor. This is type of hair loss is normally temporary and self correcting but in some cases you should consult your doctor and possibly lower your dosage or switch altogether. 4. Hair Loss caused by medications. Check with your doctor to see if your medication contraindicates hair loss. The body normally can quickly recover once adjusted to medications however in some cases it will continue for as long as you take it. 5. Auto-immune conditions. Condtions such as diabetes, hypothyroidism, rheumatoid arthritis, intestinal cystitis, fibromyalgia, celiac disease, and lupus. 6. Hair Loss caused by Hormones. Androgentic alopeica (hereditary hair loss) is the number one cause of female pattern hair loss. It accounts for a slow decline in scalp hair density. When testosterone coverts into DHT it has a miniaturizing effect on the hair follicle which leads to thinning and ultimately hair loss. Also low levels of estrogen and progesterone can be the culprit as well as high levels of cortisol. 7. Hair Loss caused by stress. Unless you are pulling your hair out from stress (trichotillomania), then the female hormone cortisol can elevate and cause antigens to attack the scalp and cause hair loss. Also stress can worsen autoimmune diseases by affecting the hypothalamus and pituitary gland which will secrete hormones that promote inflammation. **Consult a Trichologist to get a complete list of the recommended blood tests that are relevant to hair loss and scalp disorders. Info 101: What can I expect on a visit to a trichologist? Many natural hair wearers suffer with hair loss. Disorders of the scalp, health conditions, vitamin deficiencies and even heredity can be causes of hair loss. The best person to seek advice is someone who specializes in hair and scalp care – a trichologist. Mary Harris noticed that her hair was thinning. Her loc stylist recommended that see a trichologist. Below she not only shares her hair story, but an in-depth look into her trichologist experience. Mary’s hair journey … My hair journey started years ago because of my love for the natural black beauties of the 60s and 70s. When I first attempted locs it was to no avail. I didn’t have a true understanding of why I wanted my hair locked, so I went back to the relaxing – aka – ‘hair crack’ as my girlfriend calls it. Almost four years ago I saw the movie by Chris Rock called Good Hair. It made me ask myself some deep soul searching questions about the authenticity of my look as a woman of color. I am not saying relaxing is not being authentically black; I am saying my authentic me is natural. Also, as a health conscious person who has had major illnesses, I was concerned about the risk of having a chemical that can melt an aluminum can being applied directly to my scalp and its long term impact on my overall health. So I cut my relaxed hair and started my natural hair journal ‘for real’ this time. I had a lot of trials and errors when it came to searching for products and locticians. But I now love my hair and embrace it as a part of who I am at the core of me. I won’t go back to chemically processing my hair. I love it [being natural] too much. I am also still learning how to care for my hair. Her advice to those contemplating going natural … My advice would be to really understand your reasons for going natural. I realized the first time I went natural why it didn’t stick; I was not sure of why I was doing what I was doing. Also do your research on natural hair care providers, products and the history behind black hair. Just like picking a doctor make sure you check into the stylists’ credentials and licensing. On noticing her hair thinning … I noticed around November that I was losing hair around my edges, especially on the right side of my head. I was very concerned because it was an overnight thing. I consulted with my loctician, Mr. Salih Watts of LocLov Styles. We discussed environmental reasons, stress, health and any other changes in my life that could have led to the loss of hair. He referred me to a trichologist. The trichologist experience … A trichologist is a licensed cosmologist or medical professional who is certified in the study and treatment of the hair and scalp. A trichologist looks at your overall health to seek the cause of hair loss or scalp issues and formulates treatment. I was a little impatient in waiting for Salih to email me his referral of a trichologist, so I searched the internet and found someone – who will remain nameless. Let me say the experience left me very disappointed, embarrassed and disrespected. It was a pure nightmare. But I was glad I did my research and knew what to expect from a consultation with a trichologist. I knew this person was not giving me a detailed review of my hair. So I went to Mr. Bobby Spence of The Hair Loss Clinic, Trichological Associates. Several of my stylist’s clientele go to him. I was told to bring my most recent blood test results or they would refer me to a lab to do the testing. On the day of the consultation, I was not sure what to expect after my first encounter with the trichologist. Mr. Spence was very knowledgeable about health issues and their impact on hair growth. He discovered that I was severely anemic something of which my doctor had neglected to tell me. After reviewing my test results and examining the condition of my hair and scalp through a microscope, Mr. Spence informed me that I had two forms of alopecia. He said that I had non-scarring cicatricial alopecia caused by chemicals like relaxing, and diffuse alopecia areata which is caused by underlying deficiencies. He formulated a treatment plan that would work on my budget. I told him I was “balling on a budget”, so he suggested a holistic approach with my financial situation in mind. The plan incorporated an overall lifestyle change including eating more cold water salmon, tuna, sardines, liver and green veggies, especially kale. He also suggested eliminating all white foods like white breads, pasta, starches and grains and replacing them with quinoa and brown rice. He gave me information on the types of dyes I should use (if I really have to dye my hair) – brands like Bigen and INOA which are ammonia free, and he told me to avoid hair products with alcohol in them. He instructed me to follow this plan of action for one month then to go back to get a blood test done and revisit with him. I learned that our hair can be an early indicator of other health problems internally. I was so glad I found the right trichologist. I am also glad that my loctician knew what a trichologist was. These two hair specialists worked together to help resolve my problem. So a lifestyle change is in order! I feel this will help me be an overall healthier me. Advice when it comes to seeking out a trichologist and/or natural hair stylist … If you feel you are not getting what your hair needs with a stylist it is okay to change stylists. I went through three before I found my loctician, Salih. I went to two different trichologists. Do your research in regards to your natural hair needs and find the right person to fulfill those needs. It is just like any other health care concern. And, yes, stylists in a way are providing health care for your hair. The best stylists I have had have always given me a consultation concerning my hair’s overall health. Again, I would say don’t be afraid of changing stylists. This person is going to take care of a part of your hair just like a doctor, you need to be comfortable in the fact that they know their craft and are keeping abreast of the latest industry trends and hair care options for natural hair care treatment and products. My loctician, Salih Watts, owner of LocLov Styles was not my first hair care provider, but once I found him I knew he knew his stuff – the same with Mr. Bobby Spence of The Hair Loss Clinic, Trichological Associates. He wasn’t my first trichologist, but he is the only one I will be seeing and referring. It was several years ago when I realized that I no longer had edges on the left side of my head. I was completely bald with patches of hair, and it looked as awful as I felt. What I was experiencing looked very similar to what Naomi Campbell went through back in 2010. I cried for weeks after realizing that I was balding, and I felt absolutely powerless. After a while, I knew that I had to do something to regrow my hair, so I put on my big girl pants, and made a doctors appointment. Following an examination, my doctor gave me some iron pills, and told me to ditch the weaves. After a few months of TLC, and a haircut, my edges were healthier and stronger. But the frightening experience is one I’ll never forget. What I was suffering from, and what Naomi was suffering from in that infamous 2010 photo, is called traction alopecia, and it’s not a laughing matter. Many black women suffer from the same medical issue, and there are a number reasons why, including stress and the methods used to care for black hair. Alopecia is a medical term for hair loss. There are many types of alopecia, but the kinds that impacts black women the most are traction alopecia, which happens when the edges of your hair starts balding, and alopecia caused by chemical straighteners. Telling black women to give up braiding their hair, or to stop using chemical relaxers and straighteners, is easier said than done. One reason being is that many employers have imposed unrealistic hair standards on black women, and it has been happening for decades. History proved that as black women followed their employer’s hair standards in order to keep getting their checks, they sometimes ended up bald or balding, and what woman really wants that? If you look at a black woman with a curly hair texture, you’ll notice that her hair naturally grows upward and outward, but a lot of people don’t realize that, especially some employers. An Afro. A real no-no, announced the ‘Glamour’ editor to the 40 or so lawyers in the room. As for dreadlocks: How truly dreadful! The style maven said it was ‘shocking’ that some people still think it ‘appropriate’ to wear those hairstyles at the office. ‘No offense,’ she sniffed, but those ‘political’ hairstyles really have to go. According to Genie, a beautician and hair loss specialist in the Atlanta area who has been treating hair loss for more than three decades, she’s seen plenty of black women left out of jobs for not wearing their hair the way it naturally grows. She said that even after the government passed the Civil Rights Act in 1964, which addressed dress code discrimination, black women still had trouble finding jobs because of their hair. So they did what they had to do to get a check, and paid a lot of money to have chemically straightened hair. “We couldn’t get jobs as secretaries, customer service [representatives], cashiers, because we didn’t have [our hair] straightened,” she said. To help these women, Genie would install capless wigs on her clients, which allowed the scalp to breath, without causing damage to the their hair follicles. Unfortunately, a lot of women can’t wear wigs to some jobs, including service members with jobs that requires them to not wear them due to safety hazards. 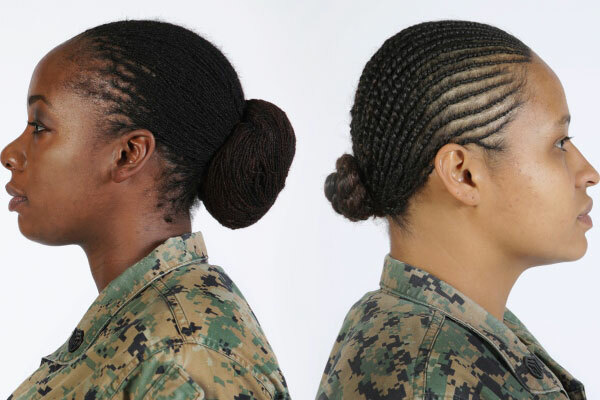 Bobby Spence, a Virginia-based Trichologist and Hair Loss Specialist, says that military hair standards that requires black women to wear slicked ponytails, micro braids, or tight cornrows, are enforced because it allows the service member to put on kevlar helmets, or military approved head wear. But those hairstyles, coupled with sweat and germs that falls on the scalp while they’re working, has been known to completely destroy black hair, which could result in some severe cases of alopecia. “Being in the military, you have to wear ponytails and keep your hat on,” Bobby said. “So think about all the years of putting your hair in a ponytail, all that traction that’s going to your temple, and your edges are breaking off every time. That causes hair loss.” But employers aren’t completely to blame for hair loss in black women. A lot of hair care techniques for black women are passed down generationally, but what isn’t often passed down are proper techniques that keeps alopecia in mind. Several years ago, Beyonce was slammed for not combing her daughter’s hair. What Beyonce was doing was maintaining the health of Blue Ivy’s natural curls. Bobby said that generational hair care techniques are definitely one reason why hair loss is so prevalent among black women. While tight ponytails with barrettes and beads, chemical or heat straighteners, and tight braids, helps black children maintain cute hair styles, it can also cause a lot of damage to it. in their hair because they think that it is more mild than a regular relaxer, but they both disagree with this line of thinking. A chemical is a chemical, and no matter how mild it is, it can still cause hair damage and breakage. The good news is that if you have alopecia, or if you’re leery of using chemicals in your hair, there are techniques you can apply to keep it healthy. Celebrity beautician Mushiya Tshikuka, break out star of WE TV’s reality show “Cutting It In The ATL,” and owner of The Damn Salon in Atlanta, says that you first have to identify the technique that you’re using that’s causing your hair loss. Mushiya says that one great technique to help grow your hair while battling alopecia is to use clip-in hair extensions. She says that one of the reasons why she created Runway Curls, her exclusive line of Ethiopian textured virgin hair extensions, was to help her clients battling hair loss. The clip-in extensions from her hair line, which should be available for purchase within the coming months, can be blended with natural hair without causing too much tension on the hair, while still allowing you to look and feel fabulous. Bobby made it clear that weaves and generational hair care techniques aren’t totally to blame for alopecia. Besides stress, hair loss in black women may be an indicator of a deeper medical condition. Bobby, Mushiya, and Genie say that if you see your hair thinning, or balding, you should seek professional help immediately. As long as the hair shaft isn’t damaged, anyone can recover from alopecia. But if the shaft is damaged, you’re pretty much screwed. It’s pretty well drilled into us now what we need to do to achieve great hair: lay off the hot tools, change up your hairstyle every day so you’re not causing damage in the same places constantly, never send a brush through wet hair, and feed your strands weekly with a rich moisturizing masque. But what happens if you follow these rules religiously and are still finding that you can’t grow your hair past your collarbone without it breaking off? What if it’s a sea of split ends or just generally a thin, fragile mess? Just like diet can play a role in improving your skin, what you eat is an important part of your haircare routine, too. Would it be best to reword this to: “When we indulge in an unhealthy diet with limited nutrients, our body uses these for the more vital organs in the body – since the body technically doesn’t require hair to function, it limits the supply” “Hair is the fastest growing tissue in the human body,” says trichologist — that’s a hair and scalp specialist — Bobby Spence. “When we indulge in an unhealthy diet with limited nutrients, our body uses those few nutrients for the more vital organs in the body. Since the body technically doesn’t require hair to function,” it misses out, which results in thinning, breakage and split ends. Luckily, our hair works on a three part growth cycle: the anagen (growth) phase, catagen (transitional, or shedding) phase, and telogen (resting) phase. Eighty-five percent of your hair is always in the growing phase, and 15 percent is in the shedding phase, which lasts about five to six weeks, says Spence. “When we eat unhealthily, the hair stays in the shedding phase for an extended period. We need to eat better to help strengthen strands and restore the hair back into the growth phase.” Depending on what phase your hair is in, it can take anywhere from three weeks to six months to see healthy improvements. So it’s not a quick fix sitch. But diet overall never is, right?